The difference between a brushless and a conventional DC motor is that a conventional motor has a ring of permanent magnets with the coils rotating in the centre. A brushless motor has a fixed coil and a rotating permanent magnet, an out runner with the magnets on the outside rotating case and an in runner with the magnets on the rotating shaft. A brushless motor is technically a synchronous electric motor – a type of AC motor. The ESC (electronic speed control) not only controls the amount of juice going to the motor, but is also a DC-AC converter. The DC-AC converter, when being part of the motor is known as commutator. In a conventional DC permanent magnet motor it is in the commutator where the brushes rub on the rotor, causing friction, sparks and poor connection. By the brushless design, this design flaw has been eliminated. The relation between rotational speed, input voltage and torque is linear. Since the DC-AC conversion takes place in the ESC you need a special speed controller for brushless motors. So forget using your old ESC. Not all model boats would benefit from a brushless motor. Remember speed boats – hydroplanes, deep vee and tunnel hull are all good for brushless motors. 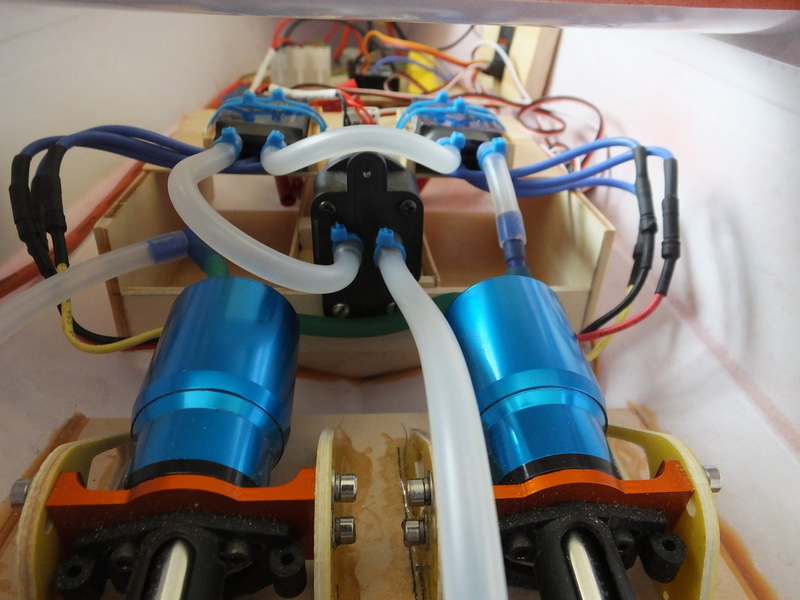 For any models that are not planing types, I see limited benefit in using brushless motors. The price advantage is still with a regular brushed motor and ESC - especially if you 'scrounge' or shop in the surplus bin. Chances are, as long as you're not chasing grams you'll be fine. 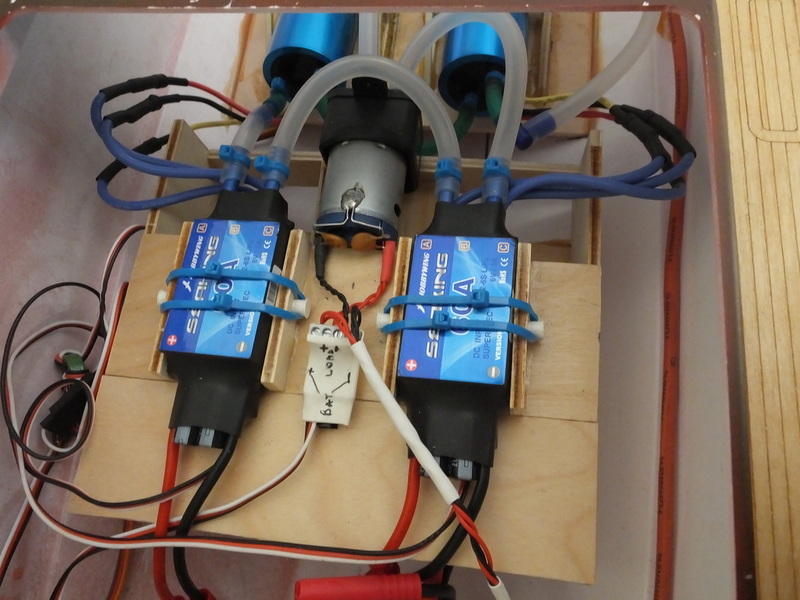 For just about all electric scale model boats, brushed motors still makes sense. If you have a PT boat, motor torpedo boat or planing launch, try a brushless. As far as brushless and scale models, a new venue is opening up, much as it did for planes and helicopters. It is now possible to build much smaller RC boats than what used to be possible largely thanks to new technology in high-efficiency brushless motors, condensed battery sizes through LiPo-technology and new compact RC gear. Much simplified, aim for similar wattage as a recommended brushed motor for the same type and size model you have. The wattage is measured as the rate at which energy is gobbled up by the motor on the supply side. Comparing a brushless motor with a brush permanent magnet motor with the same wattage and load, the brushless will run faster and last longer on the same battery charge. You may have to play with different size and pitch props to optimize performance going from a brushed to a brushless. Most brushless electric motors on the market are designed for airplanes, helicopters, cars and trucks. These motors are all air cooled. For model boats, watch for motors with an integrated cooling jacket. Some manufacturers make you buy it separate. When you shop around, make sure you consider this extra cost. Remember to shop around, read reviews and ask people. You'll find the best prices on ebay. However, I think all brushless motors for hobby use are now made in China and I don't think there is necessarily much difference between a brand name and the low-cost competition. Some useful web sites: www.giantshark.co.uk ---- very low prices. Storm RC World ----- an ebay shop with useful bits. www.pmbmodelboats.com --- model power boat parts. www.rcecho.com ----- A model shop in Hong Kong that ships to UK –very cheap prices and good stock. ..in Clive's boat, see members models.